This “cake” actually doesn’t include a single bit of cake. 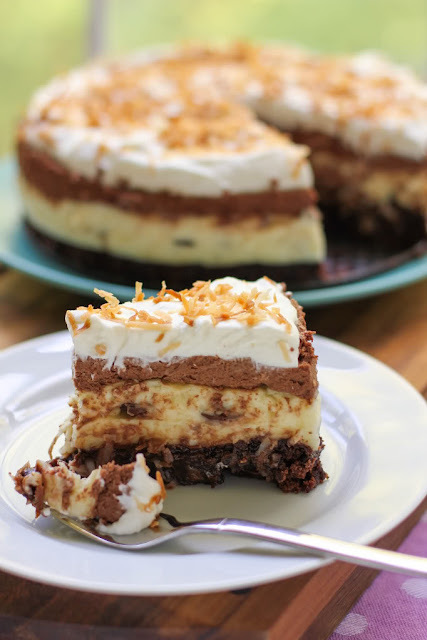 It does include brownies, coconut cream, chocolate mousse, whipped cream, chocolate bits, and toasted coconut. It’s one of the many desserts on Willow Bird Baking born out of the “more is more!” mentality. NOTE: This cake sounds complicated, but is remarkably easy! If you can bake a pan of brownies and push some buttons on your microwave, you can make this baby. It’s even easy to divide up the work, since many of the steps can be done on separate days. You can make the brownie and coconut layer one day, make the chocolate mousse layer on day two, and top and serve the cake on day three. Enjoy! Make coconut cream filling: Combine the half-and-half, coconut milk, eggs, sugar, cornstarch, and salt in a medium microwave-safe bowl. Microwave it for 4-6 minutes, whisking well after each minute, until it’s thickened (I tried this microwave trick for the first time in this recipe, and it does work well if you’re short on time, though I think you might end up with a slightly better creamy texture if you whisk the mixture constantly in a saucepan over medium-low heat; not sure how long it’ll take on the stove with this volume, but just whisk until thickened.) Once the mixture is thickened, add coconut and vanilla extracts and the untoasted coconut and stir. Pour half of this filling over your brownie layer, sprinkle on the 2 tablespoons of bittersweet chips, and then pour the rest of the filling. Stick the whole thing in the fridge to chill until firm, about 2 to 4 hours. Make the chocolate mousse: Place the bittersweet and semisweet chips in a medium bowl. Bring 1/3 cup cream to boil in heavy small saucepan or in a microwave-safe dish in the microwave. Pour it over the chocolate and let it sit for 2 minutes before gently whisking it to a smooth ganache. Cool to room temperature, stirring occasionally. Place cold water in a small dish and sprinkle gelatin over it to soften for 10 minutes. Heat it for 30 seconds in the microwave and whisk it with a fork to dissolve the gelatin. In a chilled mixing bowl, beat 2/3 cups cold whipping cream and icing sugar in to stiff peaks, adding gelatin mixture and vanilla extract halfway through. Fold the cream into the chocolate mixture and pour the mousse onto set coconut filling. Chill until set, about 6 hours or overnight. Make whipped cream topping: Place cold water in a small dish and sprinkle gelatin over it to soften for 10 minutes. Heat it for 30 seconds in the microwave and whisk it with a fork to dissolve the gelatin. In a chilled mixing bowl, whip the cream and icing sugar to stiff peaks, adding gelatin mixture halfway through. Top the cake with the whipped cream and sprinkle with toasted coconut. How far in advance can this recipe be made?